This page contains previous years event results and older news items. Please see the Events & Results tab for the Final Results. at the Events & Results tab of this website. 9/13/2017 - USAS/USMS Annual Meeting was held 9/13-9/17. Results of the meeting will be summarized in the October newsletter. ( http://swimmows.org/ ) Please see the MOWS website for a link to the results. Forty-five swimmers from Wisconsin registered to attend the meet. USMS uses Meet Mobile and the USMS website to display results. Wisconsin LMSC records were set. Results can be found under the Events & Results tab. under the Events & Results tab. One hundred seventy four (174) swimmers enjoyed competing at the meet. by the Wisconsin swimmers.Results can be found under the Events & Results tab. Records can be found under the Records tab on this website. Events & Results tab. Records can be found under the Records tab on this website. Events & Results tab, Records can be found under the Records tab on this website. Please see ( TEAM INFORMATION for RIVERSIDE ) if you are thinking about attending USMS Nationals. a t-shirt order form and a relay-availability form. The meeting was held. Minutes will be published when finished. Tentative June 17th meeting will not be held. Conference calls will replace face-to-face meeting. Results can be found under Events & Results tab, Records can be found under the Records tab on this website. Agenda and Handouts for this meeting are on this website under the About tab. Part II of the Annual Meeting will be held on December 11th. USMS Event Rankings and will be eligible for Top 10 consideration. (Oshkosh Y Masters) who set a new USMS record in the Women's 65-69 50M Br-Stroke. See results on Meet Mobile or on the Results tab of this website. please see the USMS Website ( https://www.usms.org/alts/ ). Thirty-six swimmers attended the meet. The meet was enjoyed by 170 swimmers. for all the participants to enjoy. Thank you to the WFB Masters for hosting the meet. Meet Director, for running an enjoyable and fast meet. and received an embroidered swim towel for their efforts. It was a great meet for everyone. Thank you to the Oshkosh Masters for hosting the meet. meet at the Schroeder pool. One hundred swimmers entered this meet. Results are posted on this website. The USMS Event Rankings are updated. Please see the Events & Results tab for results. the Y meet through your YMCA and not through Wis. Masters. Link is on Events tab. Please Note: See Events tab for link and WMAC housing information. the "Wisconsin Masters Swimming" identified T-Shirts/Sweat Shirts in the royal blue shirt color. be sure to check the box on the form indicating that there should be no imprint your shirt back. navy shirts in 2007 and white shirts in 2011 so you might have seen the imprint before. the YMCA @ Pabst Farms, Oconomowoc, WI. masters swimmers are on the USMS website event rankings section. note that results are on the Past Events webpage. 21 years. Thanks to Eric Jernberg and helpers for a great event. by a team of Illinois swimmers in the 4 x 100 Medley and 4 x 100 Freestyle relays. Three WMAC swimmers competed in the USMS 15K National Championship. Congrats to James Biles, Melodee Nugent and Jerry Lourigan who swam the event. Complete results will be on the USMS website soon. were swum between heats of the BSG Age Group meet on Sunday, 6/14/2015. Forty-four WMAC swimmers traveled to San Antonio for the four day meet. Please see the June-July Newsletter for highlights and pictures. The meet was enjoyed by 30 swimmers. to obtain proclamations from all states. the Men's 50-54 200 Backstroke by Jim Tuscher of Illinois Masters. for the great treats ... snacks and cookies. The meet was enjoyed by 91 swimmers. ( RESULTS ) Eighty-three swimmers enjoyed the meet. Records & Top Ten Tab for the new Wisconsin SCM records. recent e-mail from Trina ( See e-mail ). on-line entries via the Club Assistant meet entries service provider. as a recipient of the Kerry O'brien Coaching Award. (This swim is on a quiet, spring-fed, inland lake that prohibits motors. ( for swimmers new to open water, but is an enjoyable swim for all who attend. (Please Note: The pool has not been measured by USMS Rules. Forty WMAC swimmers attended the USMS SCY Nationals. and four days of outdoor pool competition in Sarasota, FL. with the record setting time of 1:30.97. Thirty four swimmers attended the meet. The meet was enjoyed by 175 swimmers. Final results are published on www.swimphone.com and on this website. Details for the relay records can be found on the results pages. ( Heat Sheet ) ( 500 Free Psych Sheet ) ( RESULTS ) results and entries. 02/01/2014 - Wisconsin Water Warriors ( Results ) Thirty-nine swimmers competed in the 2013 Wisconsin Water Warriors fitness event. Thanks to Melodee for running the event and for the statistical analysis of the results and entries. This was a developmental Open Water Swim, not a USMS event. 03/23/2013-03/24/2013 - Wisconsin State SCY Champs at Schroeder were held with 175 swimmers attending over two days. This is the largest number of swimmers who have attended the Wisconsin State SCY Champs. Everyone had the most positive feedback. Numerous new State records were set. Numerous new cutoff times were attained for the USMS Spring SCY Nationals (at Indy 5/9-5/12/2013, registration is still open). Please take a moment to see the Video from Saturday that was made by a swimmer and sent to us with a Thank You e-mail. Please also see the video-of-meet made by another swimmer. 01/31/2013 - Fifty-one swimmers participated in the Water Warriors Fitness Event, swimming a total of 1,793,470 yards (e.g., 1,019 miles) during a two-week period from November 1, 2012 to December 31, 2012. The exact two consecutive weeks were at the discretion of the swimmer. 11/05/2012 - The preliminary 2012 USMS Top Ten for Long Course Meters has been published on the USMS website. Please review Individual Events and Relay Events. Report any corrections to WITopTen@usms.org before November 20th, 2012. If these links do not work in your browser, please navigate to the www.usms.org website, select the Competition tab and select Top Ten. This version of the USMS Top Ten is subject to editing and the final version will be published at the end of December. These results do change based on feedback for corrections. In this preliminary version, Wisconsin has 56 Individual places and 14 relay places. Isn't that great! 09/22/2012 - The Wisconsin Masters Annual Meeting was held at the YMCA @ Pabst Farms in Oconomowoc. Minutes from the meeting will be added to this website at a later date. 09/12/2012 - United States Aquatics Sports (USAS) Convention is being held from 9/12 to 9/16 in Greensboro, NC. Six delegates from Wisconsin Masters are attending the USMS sessions at the Convention. This annual convention serves as the annual meeting for USMS. Reports from the Convention will be in the next newsletter. Full Convention Results are posted at https://www.usms.org/admin/conv/2012/ on the USMS website. 08/18/2012 - MOWS (Madison Open Water Swim on Lake Monona) was held and the swim was filled to capacity with 500 swimmers. 07/21/2012 - Lake Amy Belle Open Water Swim (1/2 and 1 mile distances) is complete. Results will be posted soon. Approximately 60 swimmers participated. 07/05-07/08/2012 - Wis. Masters at USMS Summer LCM Nationals - Thirteen WMAC swimmers entered the USMS Summer LCM Nationals held in Omaha at the Olympic Trials Venue. Wisconsin placed 8th in combined scoring, 13th in women's teams and 4th in men's teams, all in the Regional Team category. Complete results and team roster can be found on the USMS website ( https://www.usms.org/comp/lcnats12/results/ ). 04/12-4/15/2012 - YMCA Masters Nationals in Fort Lauderdale - Thirty-two WMAC swimmers from four YMCAs attended the YMCA Masters Nationals in Fort Lauderdale from April 12th to April 15th. Numerous new Wisconsin Masters records were set, along with YMCA meet records. One swimmer, Trina, swam within .02 of a new USMS National Record in the 50 BR. The meet location is perfect for sunshine, the beach, interesting restaurants, and great relaxation time. In the PDF Results link below, all the individual swims, requested splits, relays and new YMCA records are shown. Looking forward to next year. No time or place yet announced, but the rumor had the meet coming back to Fort Lauderdale next year, with the ISHOF Pool reconstruction beginning in May of 2013. 03/31-4/1/2012 - Wisconsin Masters SCY State Championship at Schroeder - It was a great meet on a Great Lake. We received many compliments from the attendees. The full results, including relay lead-off splits and the 1000 split, will be published later tonight (4/2/2012). For now, please see the Live Results link for splits and results. https://www.ClubAssistant.com/club/usms_members.cfm?l=20 This link will show all your friends who have already registered for 2012. If you need to lookup your USMS number from a previous registration, the On-Line Registration will prompt you with questions to try and determine your USMS Permanent ID. 1/28/2011 - The 2012 February/March issue of the Wisconsin Masters Newsletter has been e-mailed or snail-mailed to all USMS-registered Wisconsin Masters. The previous newsletter, 2011 December/2012 January, is now available to read on this website under the Newsletter topic. If you were expecting to receive a newsletter via e-mail, and did not receive the newsletter, please check your junk mail folder and mark the sender as non-spam. There were two errors in the newsletter. The MOWS (Madison Open Water Swim) is on Saturday, August 18th. Also, the meet information for the Baraboo Meet had the line for Events #3 (100 Backstroke) and #13 (100 IM) omitted due to a PDF generator issue. The meet information for Baraboo on this website is correct. 1/07/2011 - Nov-Dec Fitness Event - Water Warriors 2011, is over. Please snail-mail or e-mail entries as directed on the Info and Entry Blank (to Melodee by January 15th). https://www.ClubAssistant.com/club/usms_members.cfm?l=20 This link will show all your friends who have already registered for 2012. If you need to lookup your USMS number from 2011, the 2011 members will show on this list until January 31st. 11/01/2011 - Please remember to register with USMS for the 2012 membership year. Any registrations done on or after 11/01/2011 will be 2012 registrations but will be effective for the remainder of 2011 and all of 2012. In other words, if you do not have a 2011 membership with USMS, registering on or after 11/1/2011 will be a 14-month registration that does not expire until 12/31/2012 and entitles you to participate in USMS events held in the last two months of 2011. Use the link at the top of this page to register on-line. 9/30/2011 - The 2011 October-November Newsletter was e-mailed or snail-mailed to all 2011 registered Wisconsin Masters in early October. The previous newsletter, 2011 August-September, is now available on this website under the Newsletter topic. 5/30/2011 - The 2011 June-July Newsletter was e-mailed or snail-mailed to all 2011 registered Wisconsin Masters in late May. The previous newsletter, 2011 April-May, is now available on this website. 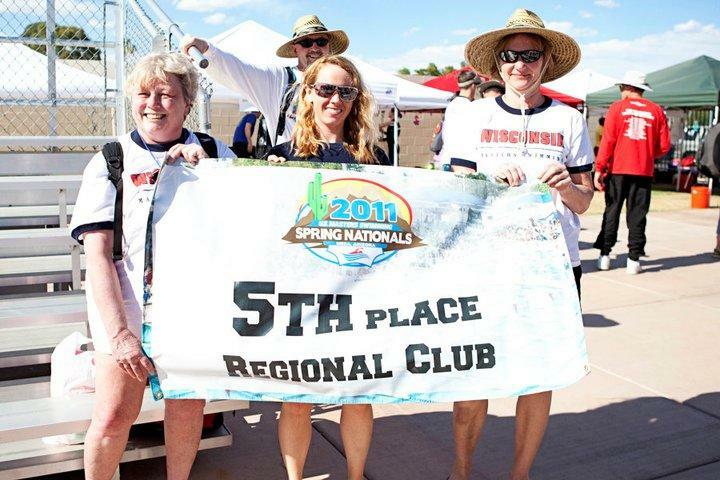 Jeanne Seidler, Erin Schneider and Julie Van Cleave hold the 5th Place Regional Club Banner awarded to WMAC at the U.S. Masters Swimming Short Course Nationals in Mesa, Arizona. Looking on is Peter Allen. Seen in the distance is Mike Murray (red shirt). Another State Meet for the record books ... All the links below have the final updated results. One point about the "Apparel" link below. The apparel (Wisconsin Masters T-Shirts) are available to any Wisconsin Masters swimmer for purchase. You don't have to be going to the USMS Spring Nationals to order the T-shirt. The "Mesa 2011" date will not be printed on the next t-shirt order. Note the printing date on the form as the is the deadline date for the shirt order is April 13th. Please see complete information on the Events & Results page. 2/5/2011 - 2011 Rule Books have been ordered for WMAC Workout Group contact persons. Expect your workout group 2011 Rule Book in the mail soon. 2/1/2011 - The February Newsletter was e-mailed or snail-mailed to all 2010 or 2011 registered Wisconsin Masters swimmers on 2/1/2011. This is the last newsletter a 2010 registered swimmer will receive. Please register for 2011 if you haven't already done so to keep your newsletter copy coming to you and to continue to enjoy the benefits of USMS and Wisconsin Masters Swimming.